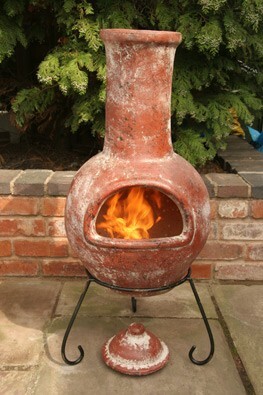 Originating from Mexico, chimineas also spelt chimenea use to be used indoors for cooking and to provide heating. When it was used back then it was made from clay which you can still buy today but it’s now also made from cast iron or steel. Nowadays, they are used outdoors for the same reasons but also for entertainment and for the classic look. 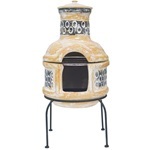 An outdoor chiminea can be used to provide heating just like a patio heater would, and many models would also embrace the original features and include a grill to cook just like a charcoal BBQ would. You can choose models to include both options or without a grill so it’ll be used solely as a heater. The main types of fuel which can be used are charcoal, wood or coal. When your outdoor chiminea is in use, you’ll need to remove the lid from the top so air can pass through to help fuel the fire and also for hot air to escape. Place the lid on top only when it’s not in use as this will prevent unwanted things from falling in. 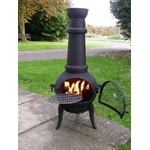 When choosing the most suitable and best outdoor chiminea there are several factors to take into consideration. Probably the most relevant question you should be asking yourself is what you want to use it for. 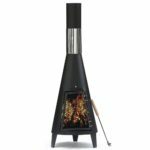 If you need a BBQ chiminea then you’d have to buy one with a BBQ grill, whereas if you need one just for heating you might be able to choose cheaper alternatives. 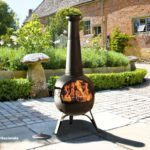 Once you’ve established what you’ll be using it for, our list of features below will also guide you on what to look out for to ensure you buy the best chiminea for your garden. 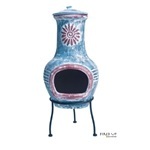 Clay chiminea – Traditionally chimineas were made from clay so it might even pull off an art look. On the positive side, clay requires the least maintenance and cleaning, on the other hand it’s susceptible to cracking. Lastly, clay does not get that hot on the outside so it’s safer if there are any kids around. 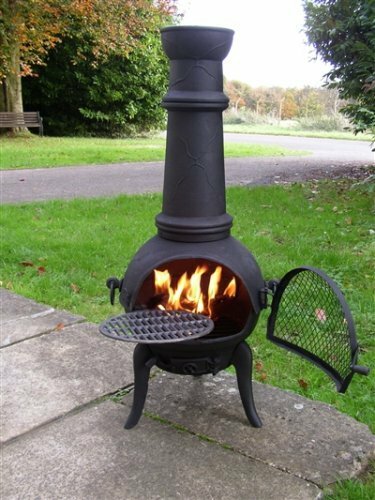 Steel chiminea – Tends to last longer than a clay BBQ chiminea due to its material being a little more resilient to weather elements. Available in larger sizes which will be better providing more heat or cooking more food. Some models come in a heat resistant paint finish which makes it less hot on the outside. Usually quite light so easy to move around, it is recommended you cover it with a chiminea rain cover when it’s not in use to prolong the life of it. 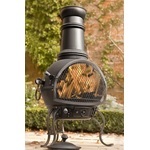 Cast iron chiminea – The most durable of them all, heavy duty but weighs a lot more so moving it can be an issue. Cast iron chimineas get extremely hot both inside and outside, so if anyone does accidently touch it, they can get severely burnt. Can be used as a heater or BBQ! BBQ grill – Having a chiminea with a BBQ grill will give you the option to use it to cook food, although it’s better for light barbecues. 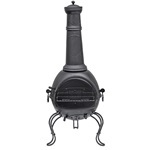 The grill can be removed if you’re not using it, so it can be used as a patio heater chiminea. 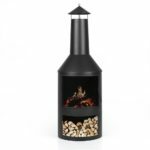 Cover included – If there is a rain cover included then it does save you money because you really should buy one in order to prolong the lifespan of your chiminea. Leaving it outside without a protection cover will make it more susceptible to damage from weather elements. Dimensions – Larger chimineas will provide more heat but not surprisingly it’ll also weigh more, making it more difficult to move. 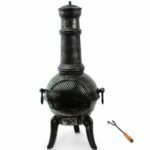 Weight – Understandably certain materials will weigh more than others, a cast iron chiminea BBQ will weigh the most by far but it’s also the most sturdy. For those who’ll be using an outdoor chiminea solely for heating, we’ll compare it to a patio heater so you can decide which one is more suitable for you. Can also be used to cook food if it comes with a BBQ grill. Being able to gather around natural fire feels more comforting and relaxing. Gives your garden a nice classic artistic look. Burning logs is more environmentally friendly. More dangerous as you’re dealing with real fire and cast iron models tend to also be very hot on the outside. Messier therefore requires more cleaning after using it. Requires more effort to keep the fire burning and more difficult to control the heat output. Different types of power source to choose from (electric, gas or electric halogen). Quicker and easier to get it started. Has a better heat output. Although some models can be heavy, there’s usually transport wheels attached for easy mobility. Smaller dimensions taking up less room. Consider a tabletop patio heater if you’re really tight on space. Less maintenance and cleaning involved. Gas models usually work out to be more expensive. Gas models produce a lot more CO2 which is not good for the environment.